So let’s talk pure gluttony today! I assure you nothing will get you there faster than these babies. But seriously, you’ve probably seen them all over the web and it’s no wonder why. There’s incredible easy to assemble and they taste like a dream. If you haven’t heard of them or even worse, haven’t tried them, then allow me to tell you why these brownies are so dang good. An irresistible brownie consisting on 3 layers: a chocolate chip cookie base, Oreo cookie center, and a final layer of fudge brownie! Preheat oven to 350 degrees. Line a 8×8 inch baking dish with parchment paper or spray with cooking spray and set aside. In a mixing bowl combine chocolate chip cookie mix with required ingredients and follow package instruction for how to prepare the batter. I like to add vanilla extract and some extra chocolate chips to the batter but this is optional. Once the chocolate chip cookie dough is combined spoon it into the baking dish and spread out creating a thin, bottom layer. Next, layer Oreo cookies side by side on top of the chocolate chip cookie dough. If there is some space left empty, simply break a few Oreos in half to fill up the space. In a separate bowl, combine fudge brownie mix and required ingredients. Follow package instructions for how to prepare the brownie batter. 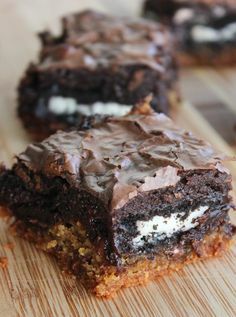 Once brownie batter is thoroughly combined simply pour the batter over the Oreo layer in the baking dish. If you pour it over the center it should fill in all the cracks and spread over the entire dish. Bake in the oven for 45 minutes. Brownies are down when a toothpick inserted through the center comes out clean. Allow to cool and set for at least 30 minutes before cutting and serving. *Adding vanilla extract and more chocolate chips is completely optional, it’s just something I like to do to give the chocolate chip cookie layer a little extra something.